This supply gives both positive and negative outputs. Appropriate Fuses should be used to protect from fire hazard and overload of transformer. The Filter capacitor C1 4700uF has an impedance of Xc = 1 / (2 * 3.14 * f * C) which comes to 0.6 ohms at 50 Hz. The impedance of the load at 2A for 24V is R = V / I that is 12 Ohms which is more than 20 times the impedance of the capacitor at 50 Hz. That means less than 1 / 20 of ripple current will flow thru the load. The Regulator also reduces the ripple a little. Math and Physics Applets - MyPhysicsLab - Physics Simulation with Java. Index of Circuit Examples - Demonstrates various electronic circuits. Digital Filters - Filters digital signals and plays the output on your speakers. Acoustic Interference Applet - Audio interference between your speakers. Waveguide Modes Applet - Electromagnetic waves in a waveguide. Antenna Applet - Generates antenna radiation patterns. 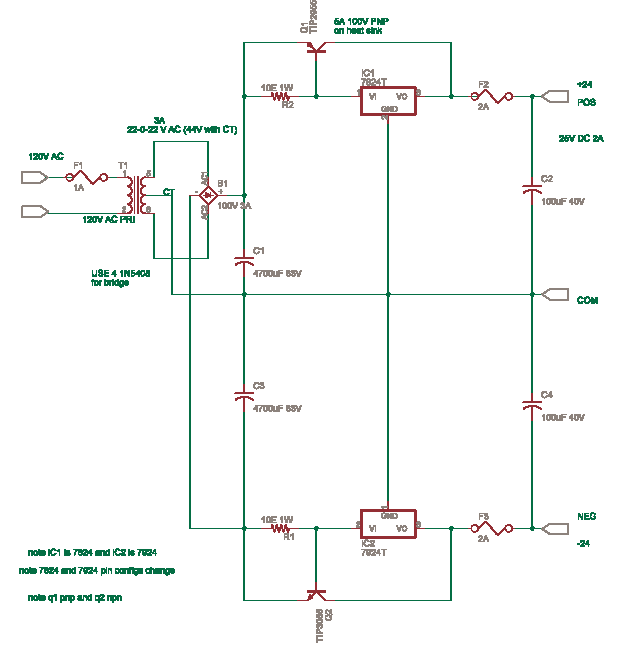 Analog Circuit Simulator Applet - Demonstrates various electronic circuits. "This java applet is an electronic circuit simulator. When the applet starts up you will see an animated schematic of a simple LRC circuit. The green color indicates positive voltage. The gray color indicates ground. A red color indicates negative voltage. The moving yellow dots indicate current." iCircuit is the easy to use electronic circuit simulator and designer - the perfect tool for students, hobbyists, and engineers.